Potential risks and practical issues | "Mom, are you a chemist, too?" 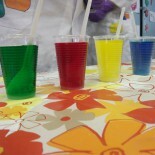 It is important not to let the children taste any of the used materials, and to use only plastic dishes, no glassware. It is better to perform the activity in a classroom without carpet. Cleaning materials and equipment (bucket, mop) have to be available.